You can apply custom styling to specific areas of a report. When creating a report in InfoAssist, you can perform the following styling customization. Global styling for the entire report. For more information, see How to Apply Styling to an Entire Report. Style data and column titles. For more information, see How to Perform Field-Level Styling in a Report. Style headings and footings. For more information, see How to Style Headings and Footing in a Report. Style the rows of data with alternating colors. For more information, see How to Style Rows of Data With Alternating Colors in a Report. Apply traffic light conditional styling to data. For more information, see How to Apply Traffic Light Conditional Styling to a Report (By Constant) and How to Apply Traffic Light Conditional Styling to a Report (By Field). Increase or decrease the amount of space inserted between rows and columns. For more information, see How to Use Cell Padding in a Report. On the Home tab, in the Report group, click Style. The Report Style dialog box opens. Select any of the following styling options that are available in the Style group. Font. Opens a drop-down list, which you can use to change the font. Font size. Opens a drop-down list, which you can use to change the font size value. Bold. Applies bold font formatting to the selected text. Underline. Underlines the selected text. Justify Left. Aligns the text to the left of the canvas. Justify Center. Aligns the text to the center of the canvas. Justify Right. Aligns the text to the right of the canvas. Font color. Opens the Color dialog box, where you can select the font color. Background color. Opens the Color dialog box, where you can select the background color for the report. Currency symbol. Opens a drop-down menu, from which you can choose a currency symbol. Options are US dollar, British Pound, Japanese Yen, Euro, New Israeli Shekel. Style Reset. Resets all settings to the default settings from the template. Note: Reset only works while the Report Style dialog box is open. Once you click OK, all changes are committed. To undo global styling after it has been committed, you must use the Undo command on the Quick Access Toolbar. Preview. Displays the text as you have formatted it. Click OK. The report is styled accordingly. The following image shows a report using the style that had been selected in the Options dialog box (medium blue). In this style, Trebuchet MS 9 pt. black is the default font. The following image shows the same report with the font changed to Helvetica 12 pt. in blue (Red 0, Green 0, Blue 255) with a white background (Red 255, Green 255, Blue 255). You can style data, column titles, or both, in the report output for the selected data source field. In the Query Design pane, select a data source field. The Field tab appears on the ribbon. Data Style. Styles only the data for the selected data source field. Title Style. Styles only the column title for the selected data source field. Data + Title. Styles both the data and the column title for the selected data source field. Background color. Click the button to open the Color dialog box, where you can select the background color for the report. The following image shows a report with the default formatting and the Revenue data column selected for styling. The following image shows the Revenue data column styled to display the American dollar sign ($) as the currency symbol. You can make a report more meaningful by adding headings and footings. Headings and footings supply context and key information about a report, such as its purpose and audience. Headings and footings also provide structure, helping you navigate to the detail sought. They enhance visual appeal. In this procedure, you will add and style a report heading and page heading. The procedure uses sample values, but you can supply values that apply to your own, reports. Headings and Footings are available in Query Design view, Live Preview, and Document view. On the Home tab, in the Report group, click the Header & Footer button. The Header & Footer dialog box opens. Click the tab for the heading or footing element that you want to add. For a report, you can add a report heading, page heading, page footing, or report footing. By default, the Report Header tab is selected. In this procedure, accept the default. Click inside the design area of the dialog box, and type the text for the heading. 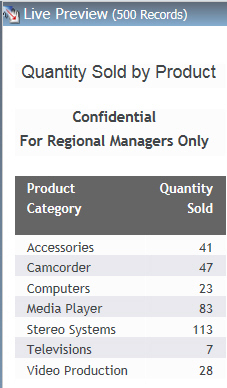 For example, the text for a sample report heading might be Quantity Sold by Product. Using the styling ribbon, apply styling to the report heading text. For example, click the arrow next to the font field, and click HELVETICA. Click 12 for the font size. The sample report heading with the selected styling values is shown in the following image. Click Apply to save the changes you have made so far, without closing the dialog box. To add a page heading, click the Page Header tab. In this procedure, you are going to add one of the supplied quick text options. Click the last button (Insert preformatted text content for headers/footers) on the right of the styling ribbon, and click Confidential in the list. Change the font and font size. For example, change the font to HELVETICA and the size to 10. You can add your own text before or after the supplied text, for example, For Regional Managers Only. Click OK to save the report heading and page heading and close the Header & Footer dialog box. The report heading and page heading that you added and styled are shown in Live Preview in the following image. To make changes, to either the report, or page heading, right-click the heading and click Edit. You can also double-click on the header to open the Header & Footer dialog box. 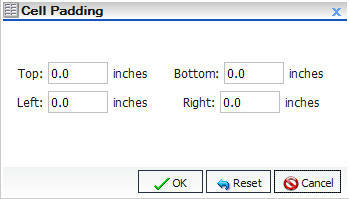 You can style headings and footings in the report output for the selected heading or footing field. With the report opened in Live Preview, select the heading or footing text that you want to style. On the Home tab, in the Report group, click Header & Footer. Select any of the following styling options that are available in the Style dialog box. Reset to Quick Styles from Template. Resets all settings to the default settings from the template. You can style rows of data in a report with alternating colors. Open the report in Live Preview. On the Home tab, in the Report group, click Banded. The Color dialog box opens. The selected color provides an alternating color scheme for the report. The report output displays alternating rows of data, using a white background for one row and a background of the selected color for the next row. This pattern continues throughout the report, as shown in the following image of Banded report output. You can apply traffic light conditional styling to data for a selected measure field. By default the report displays the values that satisfy the first condition in green, and the values that satisfy the second condition in red. Open a report in Live Preview. Ribbon: Select a field on the report, and then on the Field tab, in the Display group, click Traffic Lights. Right-Click Menu: Right-click a field on the report, point to More, and then click Traffic Light Conditions. The Traffic Light Condition dialog box opens. From the Relational Operators drop-down menu below the field name, click a relational operator. In the field to the right of the Relational Operators drop-down menu, click the down arrow for the Type drop-down menu. In the Type drop-down list, click Constant. Enter a value in the Value field. From the Get Values drop-down menu, select one of the following values: All, First, Last, Minimum, Maximum, or From File. The value that you select appears in the Get Values field. Select the value in the Get Values field. The value that you selected appears in the Value field. The value that you selected appears in the field to the right of the Relational Operators drop-down menu. From the Style menu, click the Color button. The color appears in the Preview box. Click the Drill Down button. The Drill Down dialog box opens. Click the New button to set traffic light conditions for additional fields. From the drop-down menu below the field name, select a relational operator. In the field to the right of the Relational Operators drop-down menu, click the arrow for the Type drop-down menu. The Type dialog box opens. In the Type drop-down list, select Field. The Type dialog box displays a list of the data fields that you can choose from. Select a data field from the list. The field that you selected appears in the field to the right of the Relational Operators drop-down menu. The Drill Down dialog opens. You can customize the amount of space inserted between rows and columns in a report. On the Layout tab, in the Report group, click Cell Padding, and then click Custom. The Cell Padding dialog box opens, as shown in the following image. Type the cell padding values that you want in the Top, Bottom, Left, and Right fields. The report reflects the cell padding that you set. The following image shows a report with default cell padding. The following image shows the same report with a cell padding of 0.01 inches added to the top, bottom, left, and right of the cell.